In the Southwest, salsa is our “everything” side. 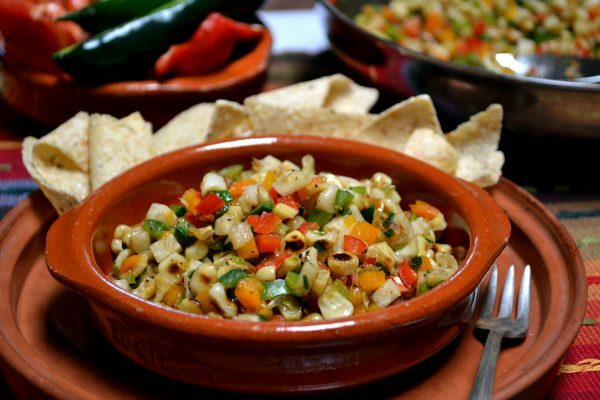 We love it every which way we can get it– salsa verde, pico de gallo, mango salsa, cowboy caviar, salsa fresca–name the dish, we have a salsa for it. Here are a few of my favorites! Mix all ingredients. Serve with pork tenderloin. Mix together and serve with salmon. In a food processor, combine the jalapenos and garlic. Process until finely chopped. Scrape down the sides of the bowl. Add remainder of ingredients. Pulse in very brief pulses. In a large skillet, heat olive oil on medium high heat. Slice corn from the husks and cook in olive oil until kernels become browned. (Caution, kernels can pop slightly.) Note: You can also grill corn on the husk until blackened, then slice off the kernels and add to skillet. In a skillet on high, cook all ingredients except the last four ingredients for 2-3 minutes. Pour mixture into serving bowl. Toss in cilantro, lemon or lime juice, garlic salt or sea salt and pepper. Serve warm or chilled.